On the Tools Menu, pick Internet Options. In the Internet Options Dialog box, switch to the Security Tab. With the Internet Zone selected, click the Custom Level Button at the bottom. 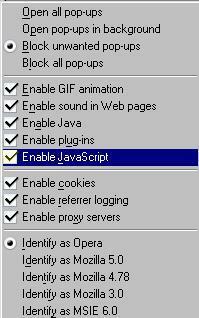 In the Security Settings dialog box, Scroll down until you see the Scripting options section. 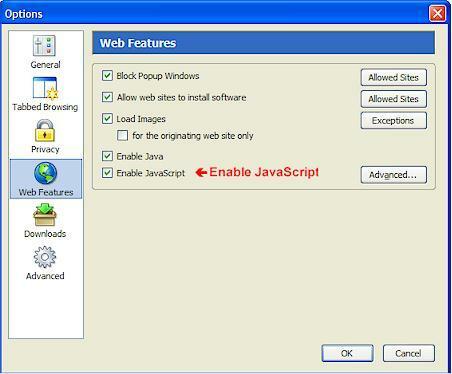 Check the Enable Active Scripting radio button. 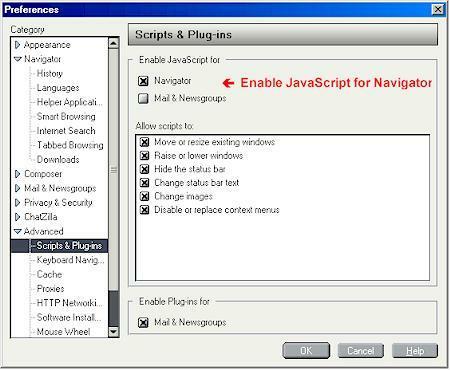 With scripting enabled, press F5 on your keyboard or click the Refresh button to reload this page. Note: there may be some variance from these instructions depending on which version of Internet Explorer you use and whether you are on a Mac or Windows machine. On the Tools Menu, pick Options. Select the Web Features Category. Note: there may be some variance from these instructions depending on which version of Firefox you use and whether you are on a Mac, Windows or *nix machine. On the Tools Menu, hover the mouse over Quick Preferences to expand that sub-menu (or just press F12 on your keyboard). Note: there may be some variance from these instructions depending on which version of Opera you use and whether you are on a Mac, Windows or *nix machine. On the Edit Menu, pick Preferences. Expand the Advanced category by clicking the arrow next to it. Pick the Scripts & Plug-ins sub-category. Note: there may be some variance from these instructions depending on which version of Mozilla or Netscape you use and whether you are on a Mac, Windows or *nix machine. Disclaimer of Endorsement: The use of trade, firm, corporation, or product names on this page is for the information and convenience of the reader. Reference herein to any specific commercial products, process, or service by trade name, trademark, manufacturer, or otherwise, does not necessarily constitute or imply its endorsement, recommendation, or favouring by the CIROP team.